A look at the remarkable life and career of Israel's 11th Prime Minister, who passed away Saturday with his family by his side. 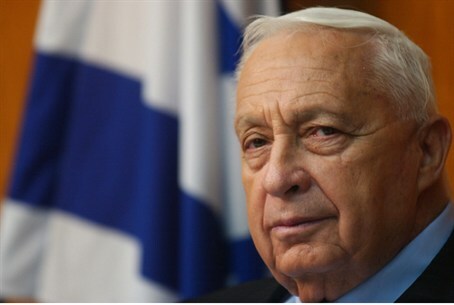 After eight years in a vegetative state following a severe stroke, former Israeli Prime Minister Ariel "Arik" Sharon has passed away at the age of 85. Although his condition had remained relatively stable for several years following the massive stroke which left him incapacitated in January 2006, the past few weeks saw a rapid deterioration in the ex-PM's health, as his kidneys and urinary system collapsed. At the start of January doctors confirmed his vital organs were failing and some sources said he had only days to live at most. But the former premier battled for over a week, before passing away Saturday surrounded by family members at the Sheba Medical Center, where he has been receiving treatment since being transferred from Jerusalem's Hadassah Ein Kerem hospital. Sharon was widowed twice. His first wife, Margalit, died in a car accident in May 1962. Their son, Gur, died in October 1967, in a tragic accident which occurred as he and a friend were playing with a rifle Sharon kept at his home. After Margalit's death, Sharon married her younger sister, Lily. They had two sons, Omri and Gilad. Lily Sharon died of cancer in 2000. A son of Jewish refugees from Belarussia (Belarus), Sharon was born in the moshav (agricultural village) of Kfar Malal, in central Israel - then known as British-Mandate Palestine. His family were members of the Mapai movement (the forebearers of the present-day Labor party) and Ariel Scheinermann, as he was then known, began both his political and military careers at an early age, joining the "Hassadeh" Zionist movement at the tender age of 10, and enrolling in the "Gadna" paramilitary youth battalion aged 14. Those humble beginnings were the start of a 30-year career and meteoric rise within both the military ranks - first within the pre-state Hagana and later the Israel Defense Forces (IDF) - as well as a bumpy yet determined political career which eventually led Sharon to the highest office in the land. Having joined the pre-state Hagana, with the outbreak of the War of Independence in 1947 Ariel Sharon was involved in heavy fighting against the combined Arab forces - both regular armies and irregular paramilitary groups - which had amassed to smother the Jewish state at birth. He was involved in the Battle for Jerusalem among other important military engagements, and was seriously wounded in clashes with the Jordanian Arab Legion during the First Battle for Latrun. Headstrong - sometimes to the point of recklessness - and ruthless in battle, Sharon quickly earned a reputation as a fierce warrior and eventually as one of Israel's greatest military strategists. As his success as a soldier gained the attention of his superiors, he rose quickly through the ranks: in 1949 he was appointed as a company commander in the Golani Brigade, and just one year later he was assigned as an intelligence officer for the Central Command, after which he left he military to pursue academic studies. But in 1951 Israel's first Prime Minister David Ben-Gurion ordered Sharon to return to active service to help found a special forces team known as "Unit 101". Sharon was promoted to the rank of major, and together with just 49 other elite fighters took part in daring reprisal raids against Arab militias, known as fedayeen, which were terrorizing Israeli communities with deadly attacks from their bases in Jordanian, Egyptian, Syrian and other Arab-controlled territories. There, the already decorated soldier became known both for his personal bravery and dogged commitment to the mission at hand, as well as a penchant for actively and aggressively seeking out confrontation with enemy forces, which gave him a reputation as a fierce warrior. The unit is a legendary one to this day, although it existed independently only for six months, before being merged with Paratroopers' Batallion 890, under Sharon's command. By the time the Suez War of 1956 broke out, Sharon had been placed at the helm of Unit 202, which later became the Paratroopers' Regiment, and gained notoriety in his operations against Egyptian forces which drew criticism from the military establishment due to allegations of recklessness. Thirty-eight of the paratroopers under his command were killed in the heroic battle of the Mitleh Pass, which critics said was unnecessarily initiated by Sharon. Although that experience temporarily hampered his military career, by the time the Six Day War broke out in 1967 he had climbed to the rank of major general. It was during that war that Ariel Sharon gained wide military acclaim, both in Israel and overseas - American military researchers took a keen interest in his astonishing success as a commander of an armored battalion during Israel's lightening victory against combined forces from more than a dozen Arab armies. The battle Sharon led at Umm Katef and Abu Ageilah, in particular, is considered to be a masterpiece of military strategy. In 1971, Sharon as Head of Southern Command faced a sever problem in Gaza, which had become a hotbed of terrorism. Following a grenade attack on a Jewish family in which two children were killed, the IDF began an intense counterterrorism campaign. By the end of the year, about 180 terrorists had been killed and around 2,000 had been captured. Gaza was quiet for the next 15 years. As Head of Southern Command, Sharon attempted futilely to convince the Chief of Staff to dilute the Bar Lev line, which consisted of a string of outposts and fortifications ('maozim') on the bank of the Suez Canal. He argued for the establishment of an alternative line of defense some distance to the east, pointing out that an Egyptian surprise offensive could annihilate the front line and leave Israel open to attack. The top brass refused to heed his warning and his dire prediction was precisely what happened in the Yom Kippur War, in October of 1973. Sharon had quit active service in the IDF in July of that year, after deciding to enter politics, but was called up as a general in the reserves a day before the war broke out, on October 6. Ever the maverick, General Sharon arrived at the front in a civilian car, only to lead the Jewish state's spectacular counterattack to the Egyptian and Syrian surprise attack which had initially placed Israel firmly on the back-foot. In a crucial defensive battle on October 14, Sharon's division was responsible for taking out 150 of the total 250 destroyed Egyptian tanks. His division was then able to cross the Suez Canal into Egyptian territory, in a move that destroyed Egyptian air defenses and made it possible for the IAF to operate over the Canal. His advance helped cut off the Egyptian Third Army in the Sinai, and led the Egyptians to sue for a ceasefire. It was in the course of the war that one of the commando fighters under Sharon's command, Yaakov Katz ("Ketzaleh"), was gravely wounded and was on the verge of dying when Sharon ordered a helicopter sent to evacuate him. Katz went on to co-found the community of Beit El and the Arutz Sheva radio station, which later expanded into a news website, and headed the National Union party in the 18th Knesset. His military career having reached its apex, the decorated though controversial military hero turned his attention towards politics, having co-founded the Likud party in the year preceding the war. Sharon's involvement in the establishment of the right-wing Likud - which subscribed to the ideals of Revisionist Zionism - signaled a marked departure from his ideological beginnings in the left-wing, Labor Zionist movement, although he at first struggled to make his mark and briefly, though unsuccessfully, courted left-wing parties as well. But his vocal and active support of the Gush Emunim movement, which was committed to resettling the ancient Jewish lands of Judea, Samaria and Gaza was a defining moment, gaining him the political recognition within nationalist circles which paved the way for his appointment, in 1981, as Minister of Defense under Prime Minister Menachem Begin. In the 1982 First Lebanon War, Sharon commanded Israel's operations to root-out Palestinian terrorist groups in Lebanon. But controversy was never far behind. Begin and his confidants, as well as the left-wing, blamed Sharon for the war, and claimed that he had misled Begin into believing, and promising the public, that it would be a short operation and that the IDF would not advance more than 40 kilometers north of the Israel-Lebanon border - the distance required for putting Israel out of the range of the PLO's Katyusha rockets. The war became a protracted one, however, and the IDF wound up capturing the capital Beirut - far beyond the 40-km line. Sharon's ambitious plan to place Christian ally Bashir Gemayel in charge of Lebanon failed when Gemayel was assassinated. In revenge, the Christian 'Phalanges' militia carried out the infamous massacre of Palestinian Arabs in the Lebanese refugee camps of Sabra and Shatila in 1982. Sharon was indirectly blamed for enabling the Phalanges' operation and eventually was forced to resign. He successfully sued Time magazine, which falsely claimed in 1983 that Sharon had discussed the need for revenge with Christian leaders before allowing the Phalanges into the refugee camps. After a short period in the political wilderness, the general-turned-politician made a comeback, serving as Trade and Industry Minister from 1984 to 1990. From 1990 to 1992, he served as Minister of Construction and Housing, with Ketzaleh as his assistant. In this relatively short period of time, over 120,000 new housing units were built, half of them in Jerusalem, Judea and Samaria. Sharon was often referred to as "the bulldozer" as a result of his military toughness, his penchant for construction, and his skill at playing political hardball. During the first government of Prime Minister Binyamin Netanyahu (1996-1999), Sharon used his position as Minister for National Infrastructure for another massive push for Jewish resettlement in Judea, Samaria and Gaza, once again firmly establishing his right-wing credentials and paving his towards leadership of the Likud: in 1998 he took the coveted position of Foreign Minister. After Likud was defeated by Labor under Ehud Barak in May of 1999, Sharon took over leadership of Likud. Barak's term was cut short with the start of the "Second Intifada". In 2000, during his brief time as leader of the Opposition, Sharon once again courted controversy with a high-profile visit to the Temple Mount in Jerusalem. Despite being Judaism's holiest site and technically under Israeli sovereignty, the Waqf Islamic trust administers the Temple Mount, and Muslim leaders have long insisted on maintaining the sole rights to worship there, viewing any Jewish visits as a "provocation". Sharon's ascent to the Mount on September 28, 2000, was seen as a challenge to the status quo and it was seized upon by the Palestinian Authority and other terrorist groups as a trigger for the bloody terror war of 2000-2005, also known as the "Second Intifada". Though his visit was - and still is - often cited as the "cause" of the violence, evidence uncovered during the war itself revealed that the Intifada was planned long in advance. As ceaseless waves of bloody attacks by Arab nationalist and Islamist terrorist groups continued to claim Israeli lives - and in particular, against the shadow of the notorious Park Hotel Massacre during the Jewish festival of Pesach (Passover) on March 27, 2002 - Sharon ordered a massive counterterrorism operation to dismantle the Palestinian terrorist infrastructure. Named Operation Defensive Shield, it was the largest Israeli military mobilization in Judea and Samaria since 1967, and succeeded in drastically reducing the number of terrorist attacks emanating from the area. The operation also added to Sharon's notoriety in anti-Israel circles, where he was branded a "war criminal", despite the exceptional lengths taken to avoid civilian casualties, and the numerous casualties the IDF suffered as a result. But the years following 2002 would see yet another political about-turn, as Prime Minister Sharon endorsed calls for the "Palestinian state" in Judea, Samaria and Gaza, committing to the US-led "Road Map to Peace" and eventually conceiving a plan that was to radically redefine both his own political stance and the Israeli political scene in general: the "Disengagement" from Gaza. That move saw the destruction of all 21 Jewish communities in the Gaza Strip and four others in northern Samaria (Shomron), along with the expulsion of their 10,000 or so residents. It was a move which shocked his former supporters on the right wing - the "bulldozer" had suddenly begun flattening his own creations - and eventually forced him out of the Likud party to found Kadima. Sharon's rivals claim that the Disengagement was the result of attempts to deflect allegations of political corruption, saying he agreed to the pullout from Gaza as part of a deal with the leftist Prosecution, in return for the Prosecution's dropping of criminal charges against his son, Gilad, in a financial scandal known as the Greek Island Affair. On December 18, 2005, Sharon suffered a mild stroke and was briefly hospitalized, but was discharged shortly afterwards. On January 4, 2006, he suffered a second, severe stroke, which left him incapacitated. He slipped into a coma and was replaced by Ehud Olmert as Prime Minister. Despite hopes at the time that he could be revived, Ariel Sharon would remain in a coma until his death some eight years later.